When Rosemary, a lovely beekeeper at our apiary, gave me a book about the true story of a man who discovers the wonders of bees and honey on a farm in Italy, I packed it in my flight bag for a trip to Rome. 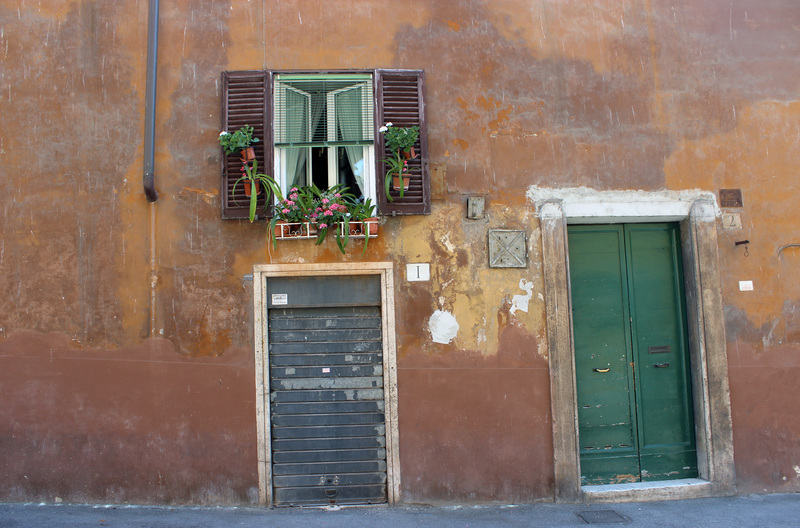 I should have sub-titled this post: ‘A beekeeper in Rome’, because it is the story of my Roman holiday and the book that accompanied my travels. Honey and Dust: Travels in search of sweetness by Piers Moore Ede begins as Piers, a young British environmentalist writer, is seriously injured in a hit-and-run accident in San Francisco and loses sense of his life’s purpose. He goes to recuperate on a farm owned by a beekeeper in Italy and rediscovers his passion for life with the help of Gunther and his bees. 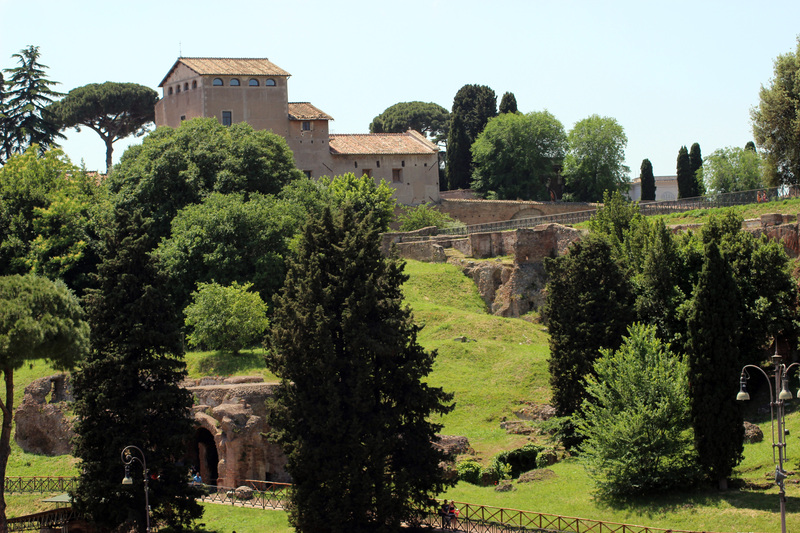 Hillside views seen from the Colleseum. The opening chapters of Honey and Dust set in rural Italy were exciting in-flight reading on my way to Rome. It is a magical moment for the reader too, and I knew then that I would love this book. By the time our plane landed in Rome, I had joined Piers in the Middle East as he began his quest to find and taste the world’s most wondrous honeys. Rome is an amazing city. 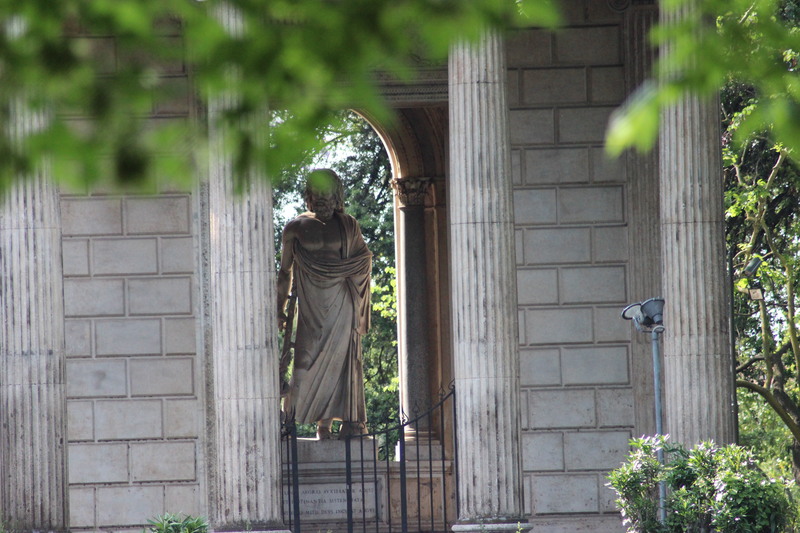 The ancient world sits comfortably with the modern world. It has style and glamour alongside history and tradition. The coffee is amazing too. 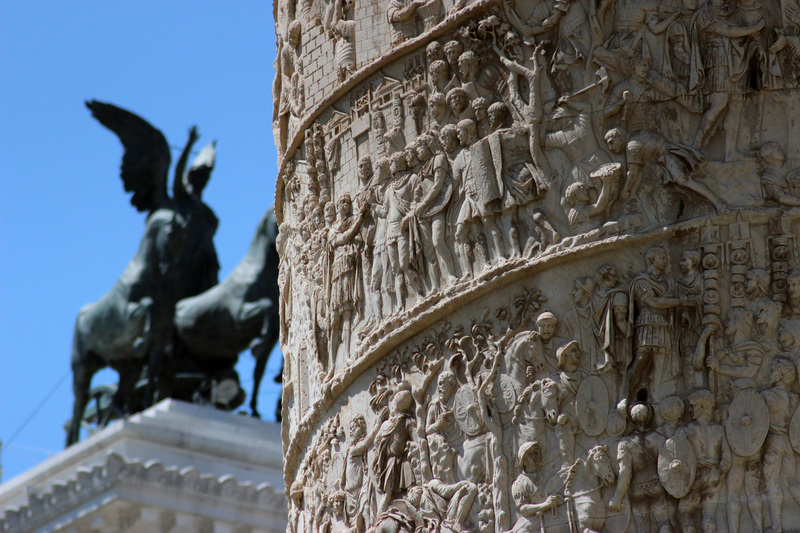 Rome – The Eternal City. The story of the ages is told on every street. 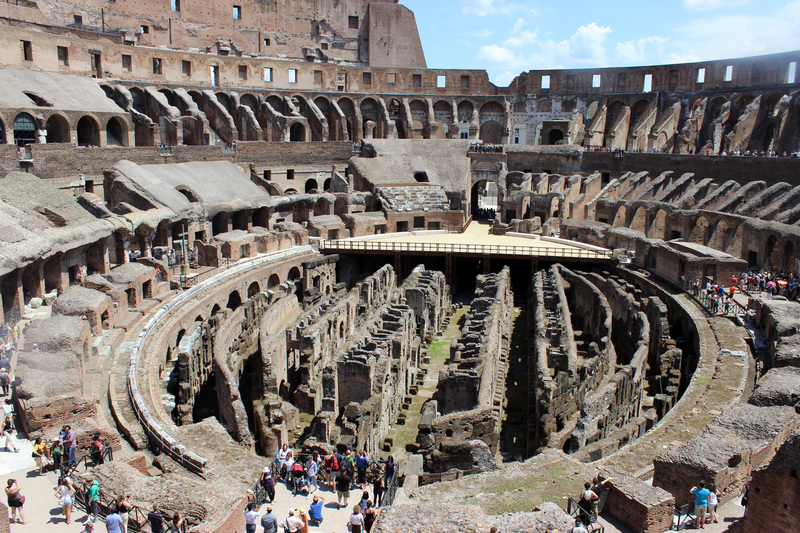 Here is the Colleseum. 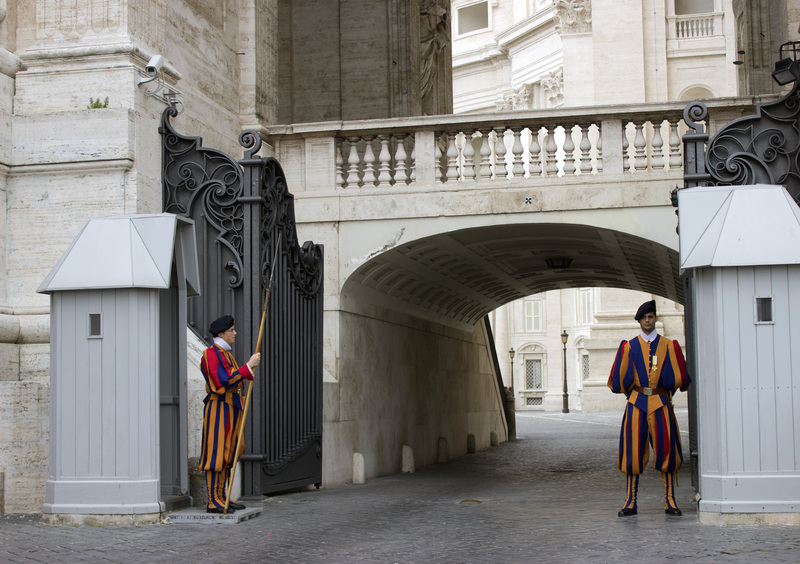 The Papal Swiss Guard at Vatican City is the only Swiss Guard that still exists. Ah, Roma! 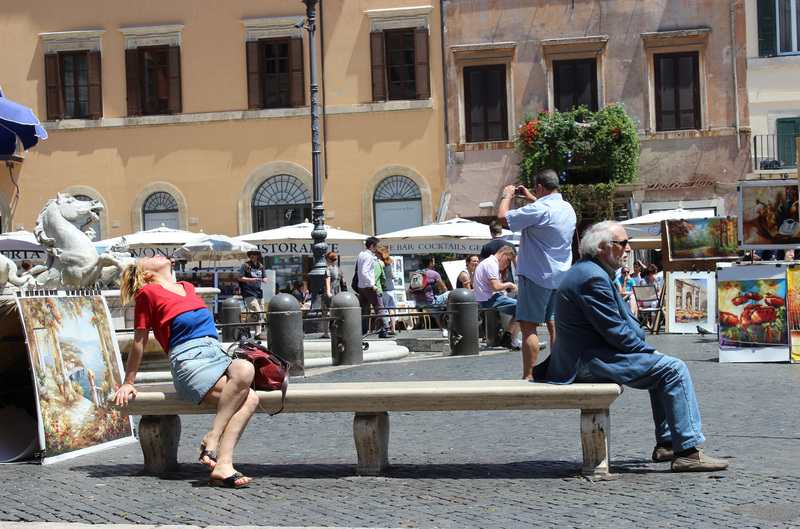 Romance in Rome as we come across an Italian TV crew filming a love story. I like tea not coffee. 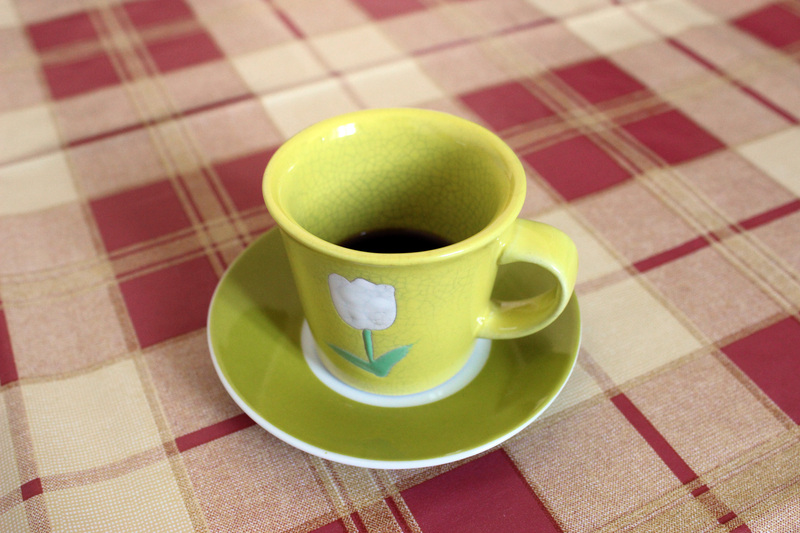 Italian coffee is delicious! Sitting with my friends in a cafe overlooking the Colleseum, I reflected how my journey was similar to Piers: exploring a vibrant and beautiful world which in parts has vanished. Honey flowed like rivers in ancient times. 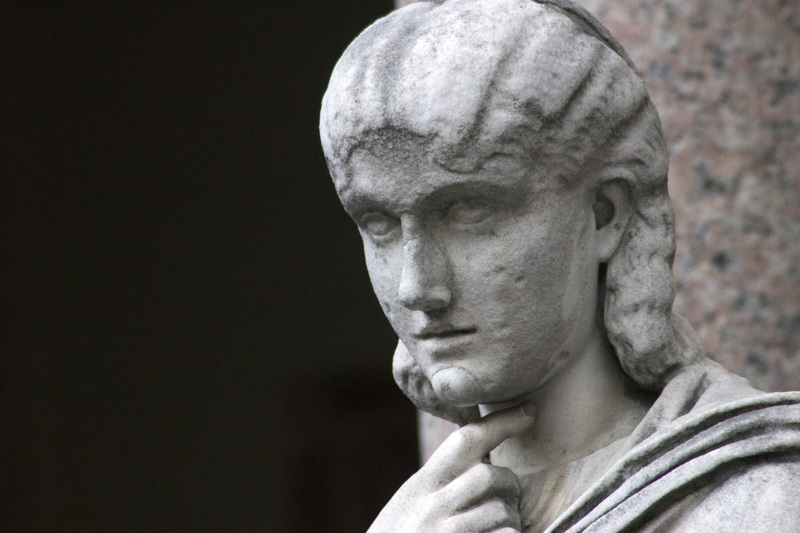 The Romans were Master Beekeepers with a particular fondness for thyme honey. Virgil and Pliny expounded the health-giving virtues of this golden nectar, and wrote detailed descriptions of beekeeping and the qualities of bees. However, Virgil thought queen bees were kings and warned of finding king cells in hives. 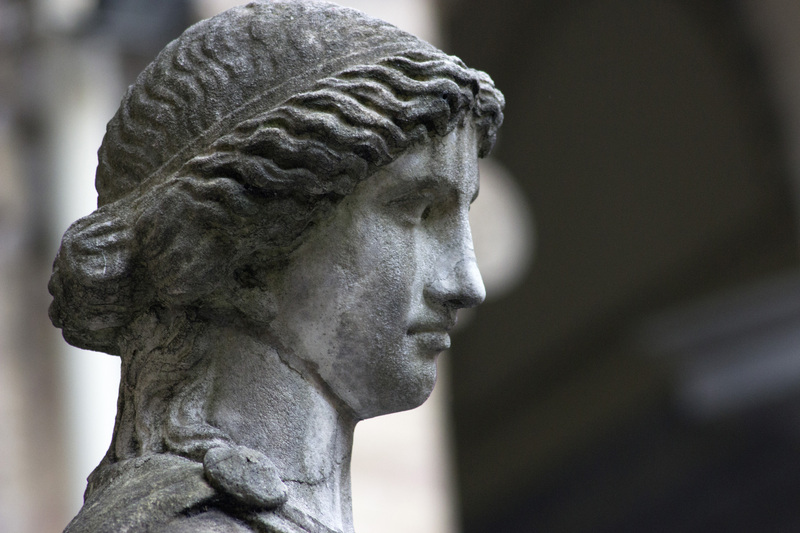 The art of beekeeping declined in Ancient Rome with the fall of the Roman Empire. Piers’ realisation that the honeybees of the wild and domesticated hives are disappearing as colony after colony is ravaged by varroa makes his quest to find honey even sweeter. 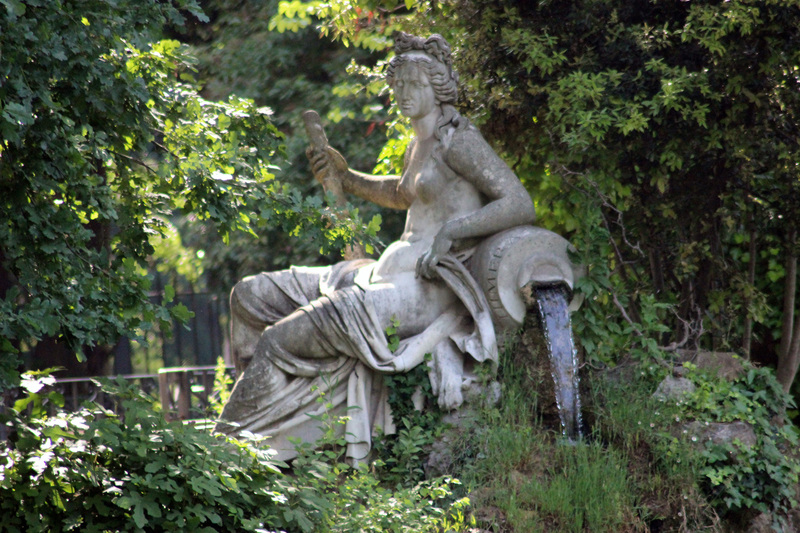 I finished reading the chapters in the Middle East as our first day in Rome came to an end, sitting in the beautiful gardens of Villa Borghese and enjoying very good Italian ice cream. 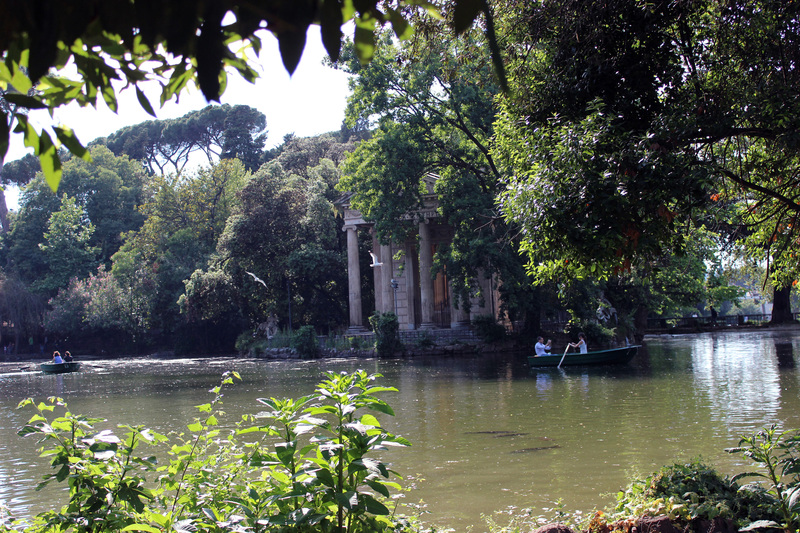 Villa Borghese is the second largest public park in Rome with beautiful landscaped gardens and an enchanting lake. The Temple of Asclepius, the god of medicine, stands in the centre of the lake. 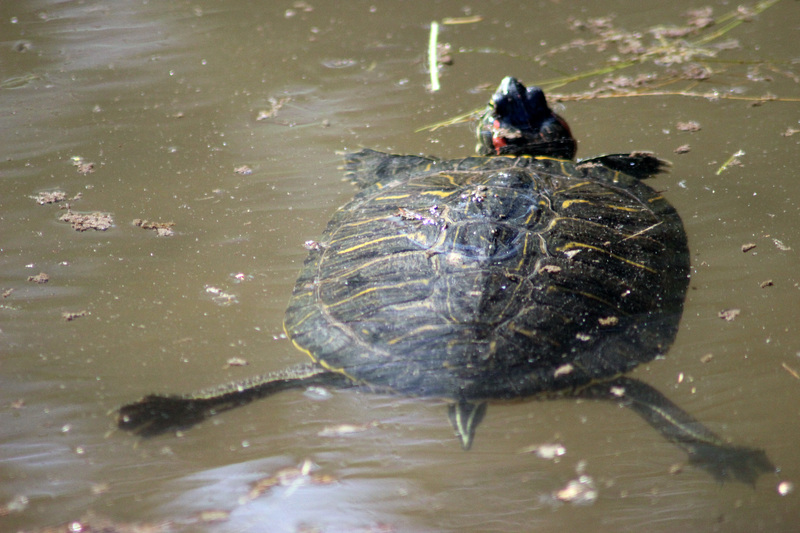 … and secret terrapin pools. 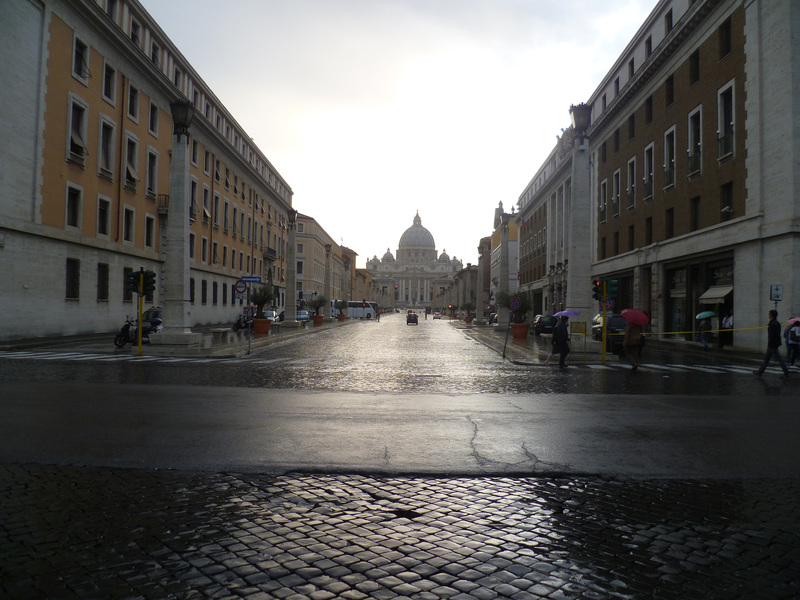 The next day we visited the Vatican – a city in a city – and I heard rumour that the pope keeps his own hives. While I didn’t see a bee, the Vatican experience can only be described as pure sensory overload. 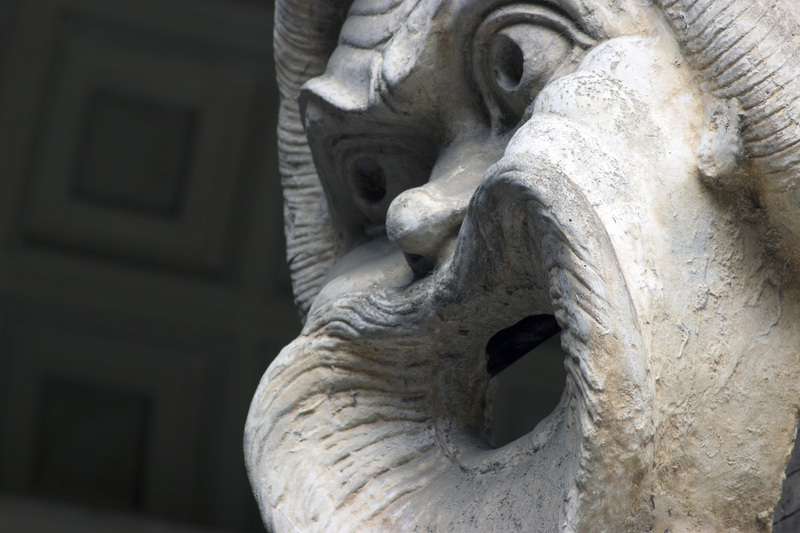 You need a guide, and a day, to see the Vatican. 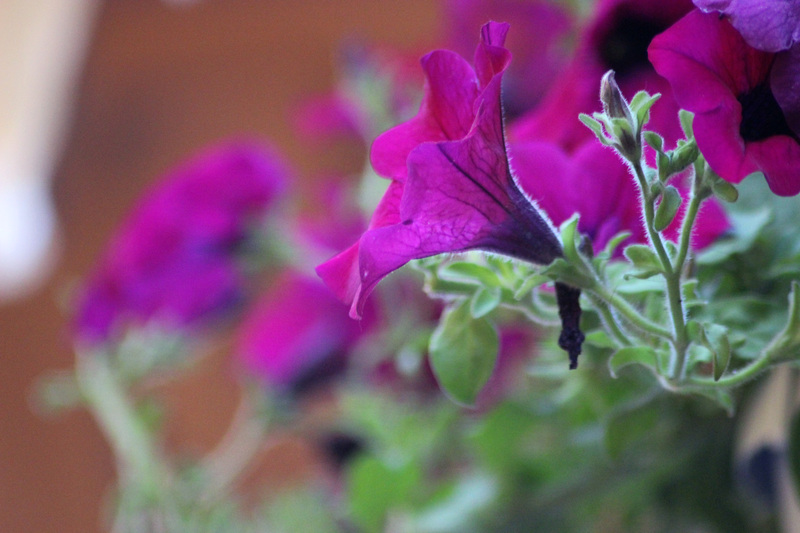 Once inside, I used an entire 8GB memory card on my SLR and it was worth every shot. 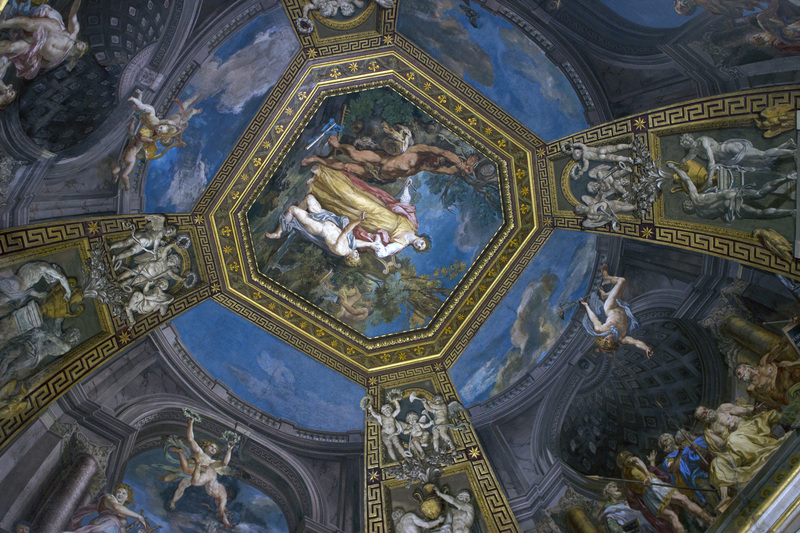 The highlight was Michaelangelo’s breathtaking Sistine Chapel, which is – indescribable. However, filming is forbidden inside the Sistine Chapel to protect the incandescent artwork, and because the Vatican owns the copyright. I wonder what Michaelangelo would have thought of that? 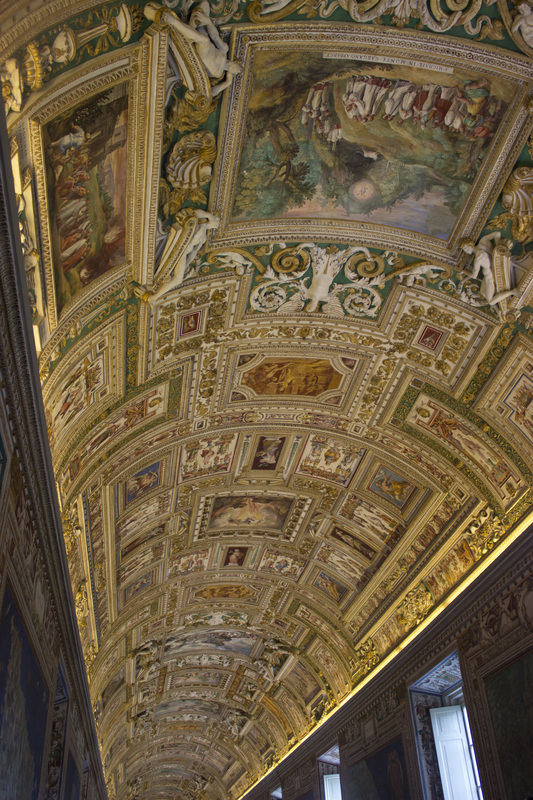 Inside the Vatican – a hall of gold and light. Art so beautiful and breathtaking. 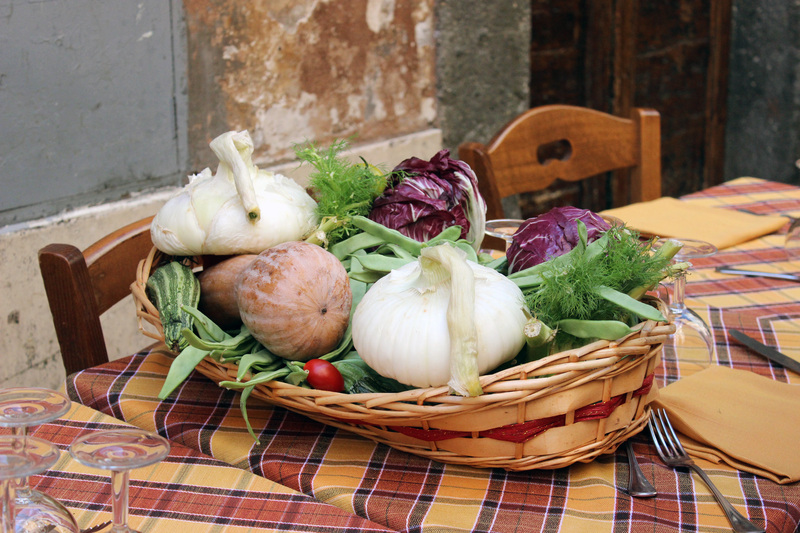 Afterwards, we sat quietly inside a family-run restaurant and digested all that we had seen and heard. As a storm threatened to break the sunshine, we were invited to stay past closing time to share a complementary bowl of cherries and limoncello. I took a peek inside my book to see what Piers was doing in Nepal. What struck me as I read Honey and Dust was the easy connections that Piers made with everyone he met. Whether visiting noisy war-torn capitals or the rooftop of the world, people warm to the young writer and invite him into their homes to share a unique insight into their hidden lives. Out of the storm – we are welcomed into a family restaurant. 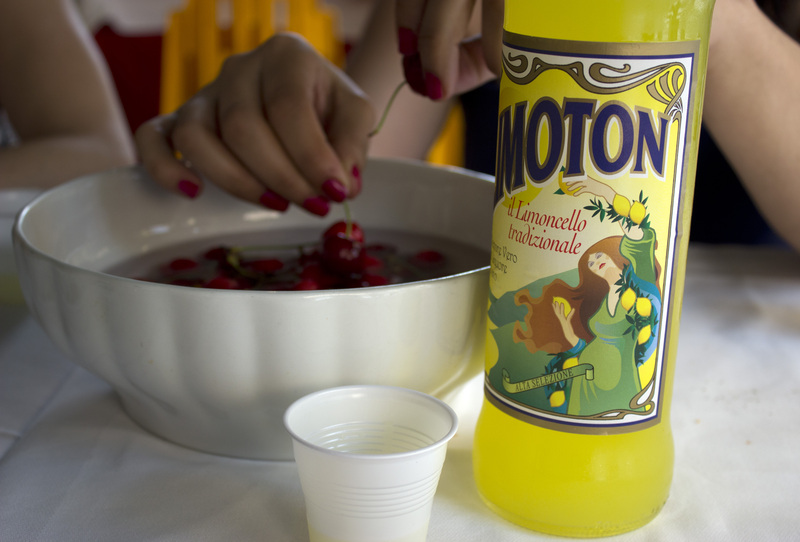 Limoncello and cherries! A risky combination. That evening we climbed the turrets of Castel Sant’Angelo, went for tapas and enjoyed drinks in a restaurant opposite the Pantheon. I went to bed exhausted, and not sure if I was excited to wake for Rome or Piers’ trek with Nepalese honey hunters through dense forests. 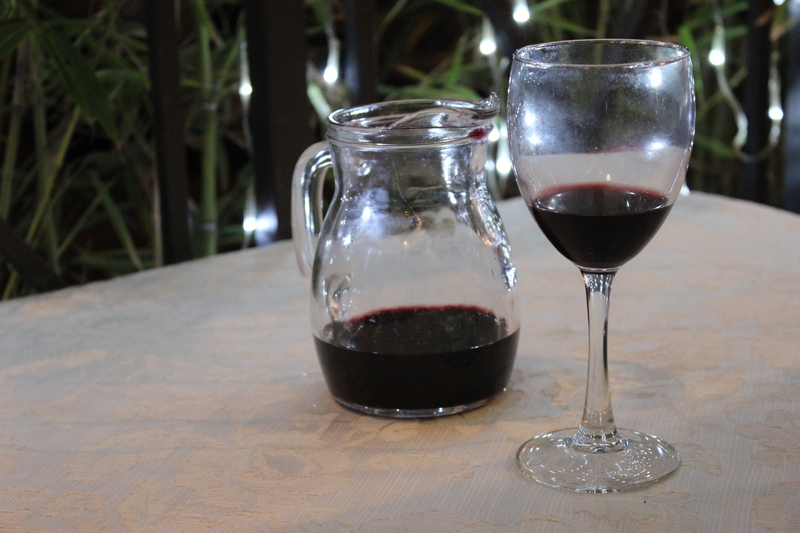 Italian wine best enjoyed on a warm evening in Rome. On Sunday morning we stumbled across mass at the Pantheon on our way to the Fountain de Trevi. 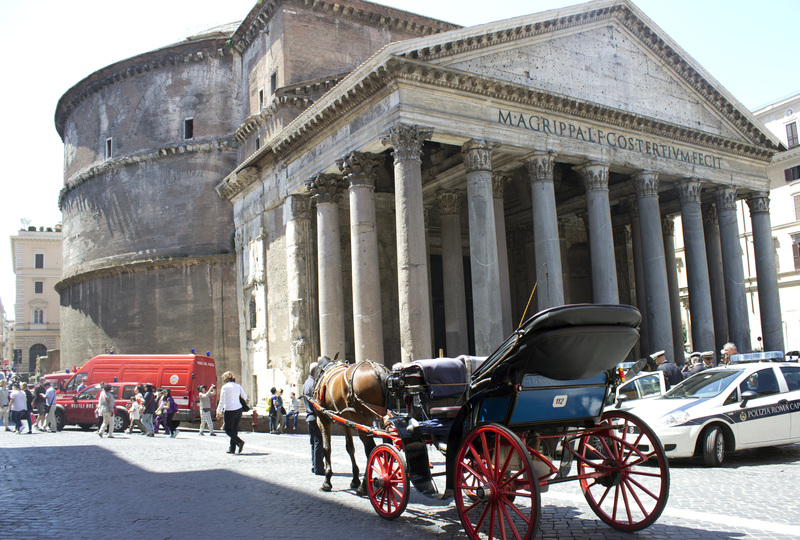 The Pantheon is one of the best preserved buildings of Ancient Rome. The rotunda uses an intricate honeycombed structure of hidden chambers to strengthen its walls. I stood at the entrance of the Pantheon watching as thousands of rose petals were poured through the oculi of the dome and tumbled down the shafts of sunlight. 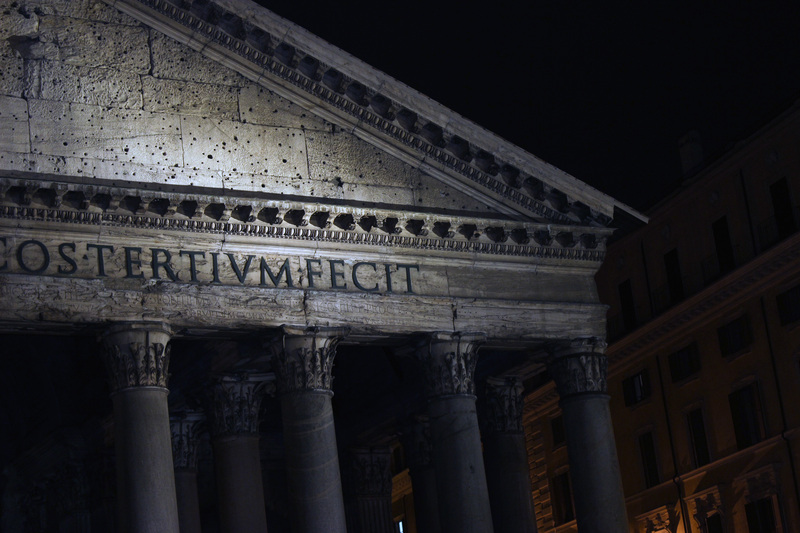 The Pantheon was built to honour all the gods of Ancient Rome. 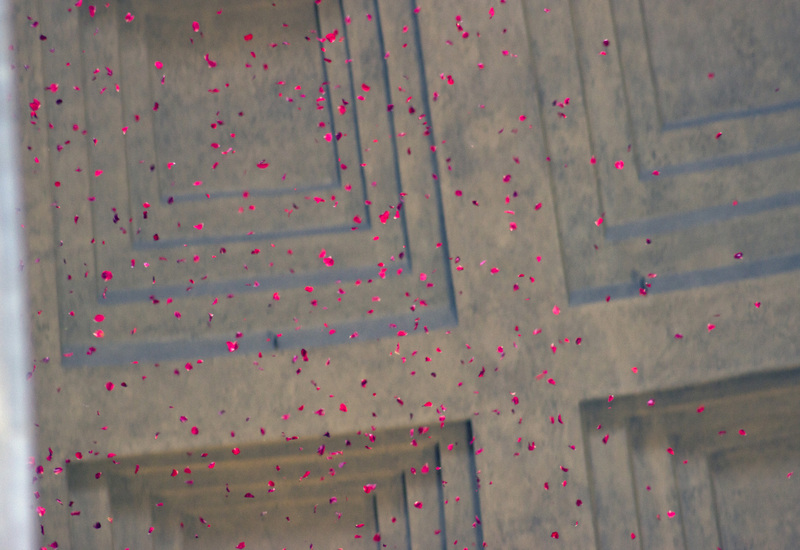 Rose petals falling from the oculi during mass. 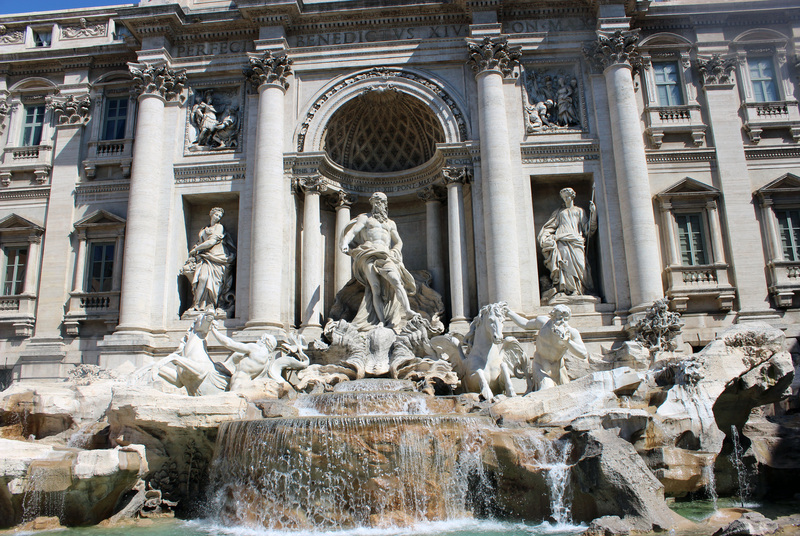 The breathtaking Fountain de Trevi. 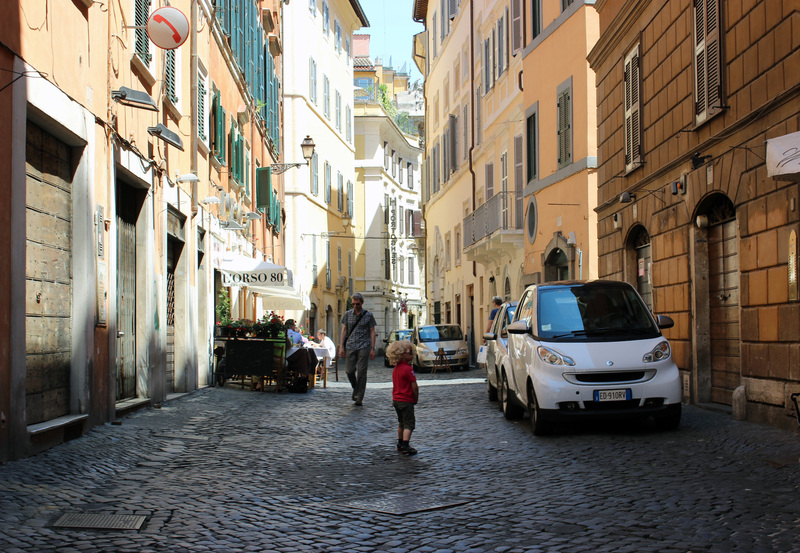 After tossing a coin in the waters of the Fountain de Trevi to make a wish, we separated to take our own mini adventures before meeting for lunch at the Campo de’ Fiori, or the Square of Flowers. I arrived before my friends and sat in the shade enjoying Sicilian lemonade with a spot of people-watching and reading. 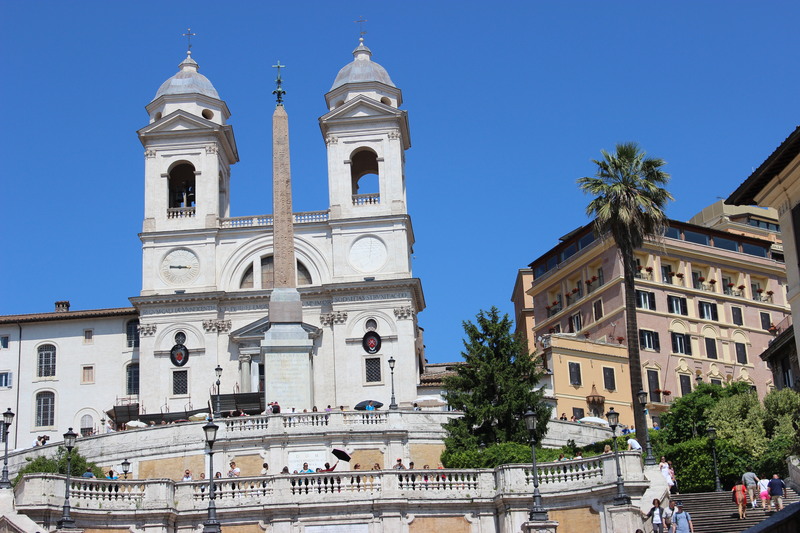 The relentless afternoon heat in Rome made my friends and me feel a little dazed, so we took Sunday afternoon at a slower pace and wandered past the Spanish Steps. As a Londoner I appreciated a city that was bustling but also relaxed. 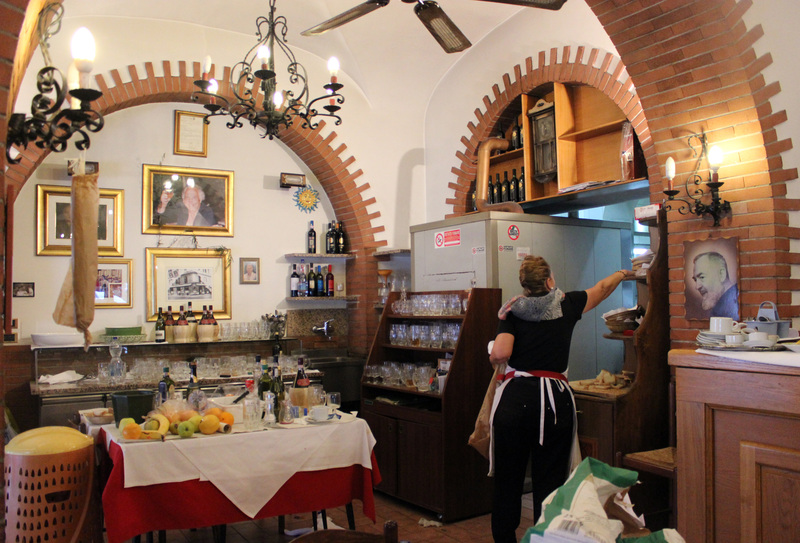 Italians seem to take life at their own pace and there is always time for coffee and cake. Egyptian obelisk at Campo de’ Fiori (the British didn’t take this one). My Bulgarian friend Dani, mistaken for the mysterious ‘Russian lady’, charms the local police for a photo. If you arrest us, can we stay? Back home in London, I missed Rome but I was left with wonderful memories and Honey and Dust would forever be indelibly entwined with my trip. The Vatican in light and shadow. As a beekeeper, I found Nepal to be the real beating heart of the book, which brought to life the ancient practices of our craft carefully preserved by forest tribes who are themselves fading from the roar of encroaching civilisation. Honey and Dust is an enchanting read that I highly recommend to beekeepers and to anyone who is interested bees and honey, but with a word of warning that once tasted you will become addicted to the sweet world of the bee. 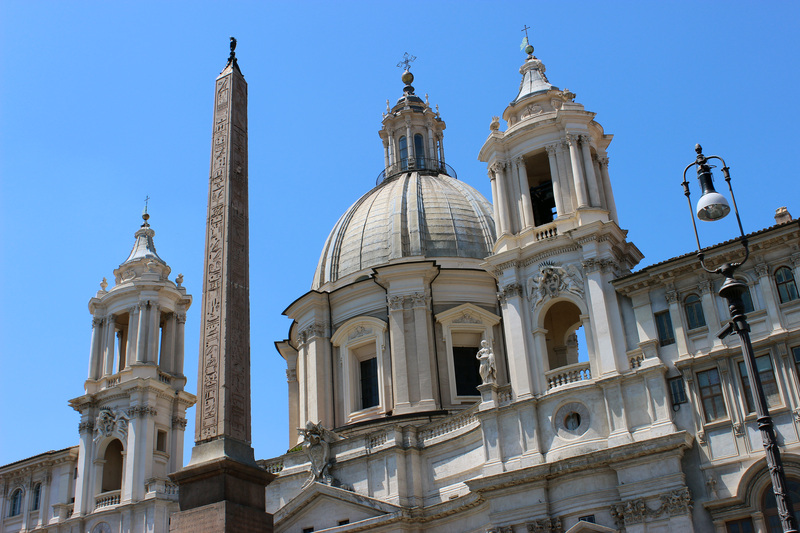 A final word on Rome – you will love it. This entry was posted in Beekeeping, Bees, Book review, Honey, Travel and tagged bee diseases, beekeeping, bees, honey, Honey and Dust, honeybee, honeycomb, Piers Moore Ede, Rome, varroa by Emma Maund. Bookmark the permalink. Thank you, Alex. Have you been to Rome? You may enjoy the book too, it’s a really fascinating look at lives and cultures – the good and the bad. I have yet to visit Rome. I shall visit Rome one day. I shall also find the book. Beautiful, wonderful! Thank you for sharing. Thank you, Sara 🙂 It’s a pleasure to share wonderful memories of Rome. Have you been to Italy? Sadly no. Although I’ve been to Europe several times, I’ve never been to Italy! I am planning a trip though, renting a car and driving from Spain to Turkey. Can. Not. Wait. Thank you 🙂 Gorgeous place! How beautiful Emma. You have surpassed yourself with these photos. Glad to have another book I can add to my bee themed collection! I felt I revisited Rome with you when I was reading the post. I’ve ordered the book! We were there last autumn and the previous spring so I can confirm that the Trevi Fountain works. Tremendous post! Thank you so much for sharing your trip and your travels in the books and your fantastic photos. All woven together so wonderfully. Wonderful post Emma. Loved your images and tour. 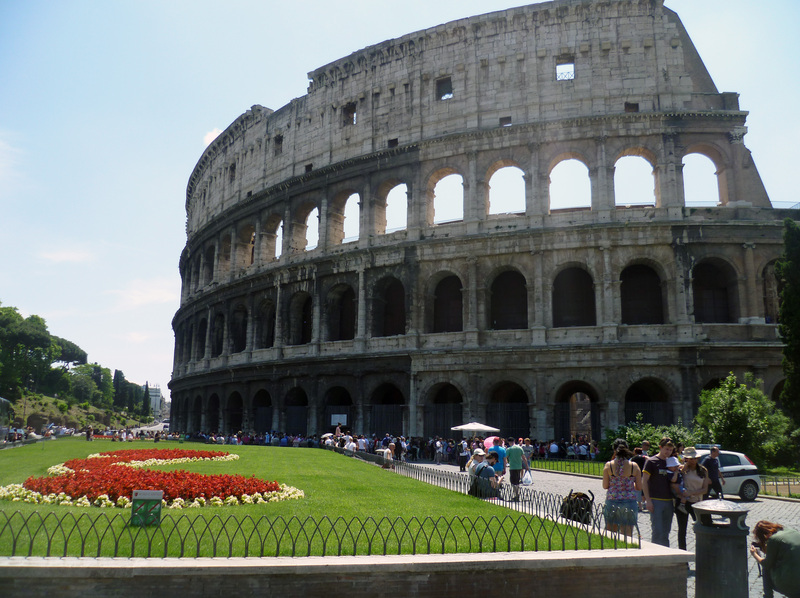 Someday I would love to go to Rome and tour Italy. In the meantime, I’ll have to settle for living vicariously through posts like yours! I hope you get to walk through Europe next, Holly. You’ll love Rome 🙂 He he! 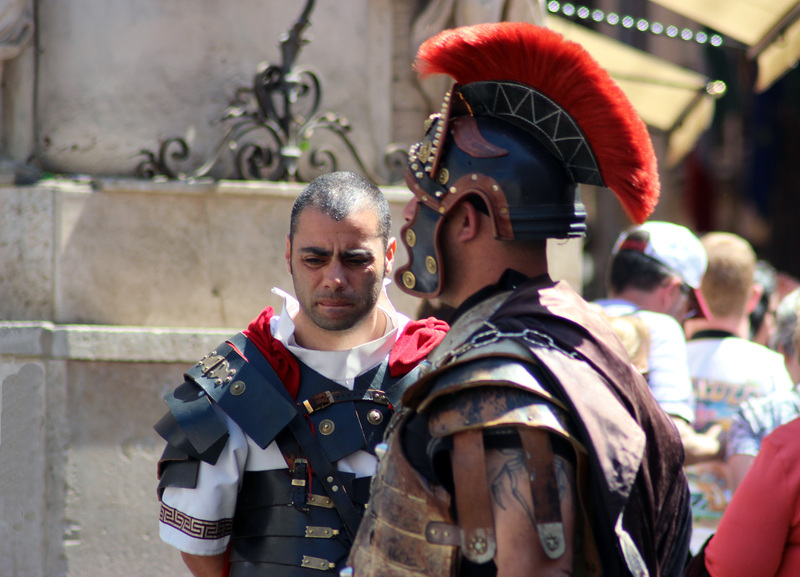 The Roman police were so surprised when Dani asked for a photo that they didn’t have a chance to refuse. 🙂 Interesting question about tattoos, they were used originally for ancient tribal markings although not sure if centurions wore them! These photographs are so amazing! They are so beautiful. It looks like more than good. I love it! Emily pointed me to your review of this book, and now I want to track it down! I’ve not been to Rome yet, and would love to hear about Italian beekeeping. Thank you for the heads up.